Discovered back in 2015, this super-high altitude route is simply one of those trails you see in movies: high, craggy scenery, once-in-a-lifetime views, a ribbon of singletrack unfurling along the crest of enormous, spiny ridges…yet at the same time it is mostly surprisingly mellow, and unexposed – so long as you have a head for heights! Even the final descent with views over cliffs to a valley hundreds of metres below doesn’t have any nasty edges anywhere near the trail and is only occasionally technical. However, it’s an awesome route for a picture – one of those which you show your friends to really make them jealous! We begin the ride with a van uplift to the top of the highest road in the Pyrenees at 2408m, before spending the morning making our way to Soldeu via the “Lawnmower” descent. This follows a simply beautiful valley across meadows, down into the trees before some easy switchbacks deliver us to Soldeu. After a bit of lunch we head back up on the ski lifts to 2550m before the final huge descent “The Edge” to Canillo, 1000m and 10km below! This descent really does make you feel like you are in an MTB movie – you follow the spine of the ridge for a few kilometres before the trail starts to dive through the trees on easy singletrack. Don’t switch off – about halfway down there’s an incredibly tough rocky feature that only one person has ever managed to ride succesfully! From here onwards it’s simply beautiful – 5km of singletrack swooping down through the forests all the way to the valley floor…. This trail originated back in May 2013 when unexpected heavy June snow forced us into new territory, but we have reworked it as a regular fixture in 2015 when we found the amazing new “Helter Skelter” descent, which fits into the old route beautifully! A van uplift drops us high above the valley at Canillo, from where we make our way gradually north along the valley wall, sometimes descending – including “The Slab” which takes some commitment to ride – sometimes climbing, before reaching the “21 Questions” descent (21 switchbacks of varying intensity!) to the valley floor. 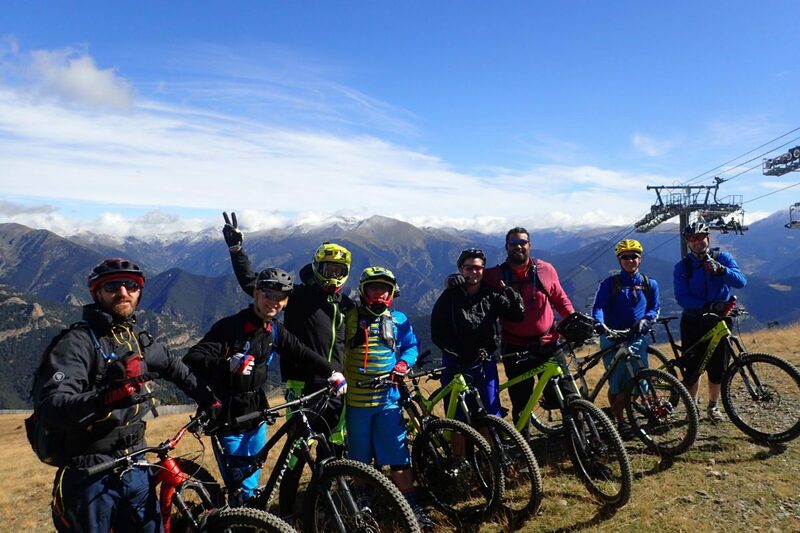 Jordi, a good friend of StS, born and bred in Andorra came across something entirely new thoroughly awesome…and since then our guides have tweaked it to give more uplift, more descents and some entirely new bits! 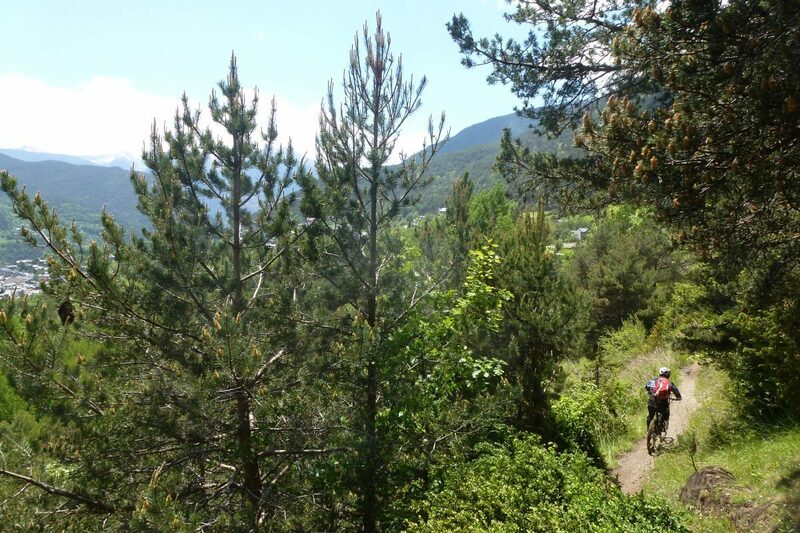 There’s two main ways for us to hit the main descent of this route: normally we go to Soldeu and use the bike park lifts multiple times, or in lower season (when the lifts are closed) we drive up to a gorgeous scenic trail which we call “The Balcony”. 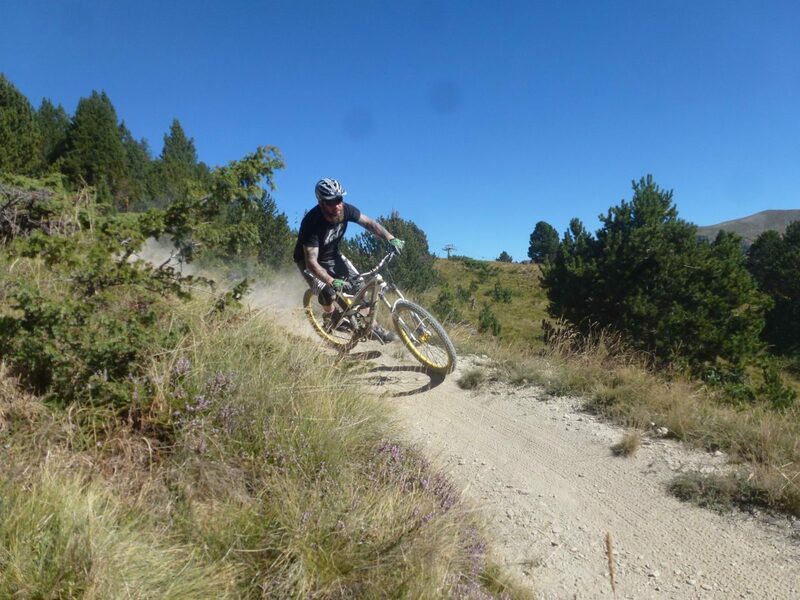 We normally ride a couple of natural trails on the fringes of the bike park – which lets us throw in a quick optional descent of “Helter Skelter” from the Snowline route too (see above)! For the main event we take the lifts all the way to the highest point of the Soldeu ski area at 2562m. From here it’s 10km and a simply huge 1300m to the bottom, following a stunning valley which swoops along a ridge before it plunges through gorges, crosses rivers and drops into the treeline about halfway down. 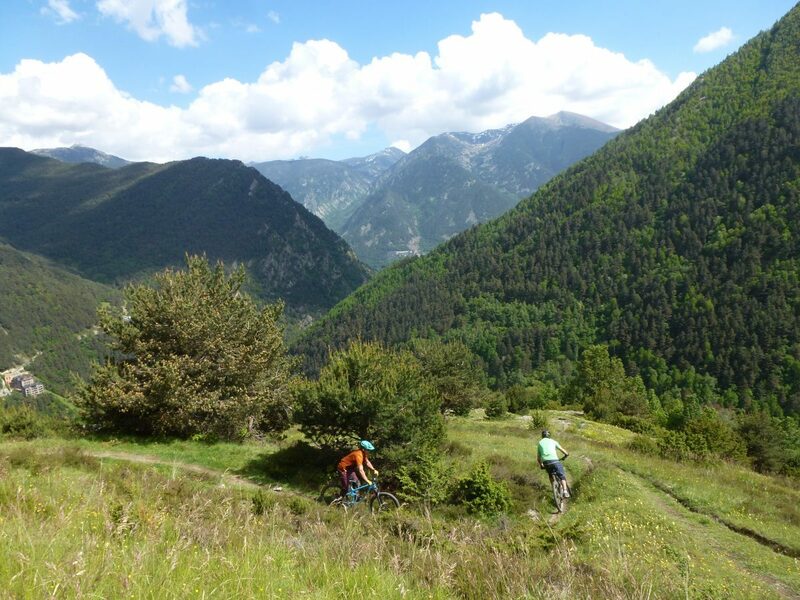 The descent has everything: flow, gentle singletrack with enormous views, steep sections, switchbacks, rock gardens…it will tick off a bit of everything! The final section – “Boulderdash” was added in 2016 and offers some great challenges to even the best riders. Amazingly, overall it’s a pretty mellow descent, but it will leave you completely satisfied – it’s a beautiful day in the mountains. Skyfall is an absolutely jaw-droppingly beautiful route, and many of the pictures we upload are taken here! We start the day by uplifting to the top of the same road we use for “Ridgeliner”, starting the ride at 2408m. We follow the same outward section for the first few km too..but rather than taking the “Lawnmower” descent to Soldeu we stay high and head across to the top of the infamous Skyfall descent. 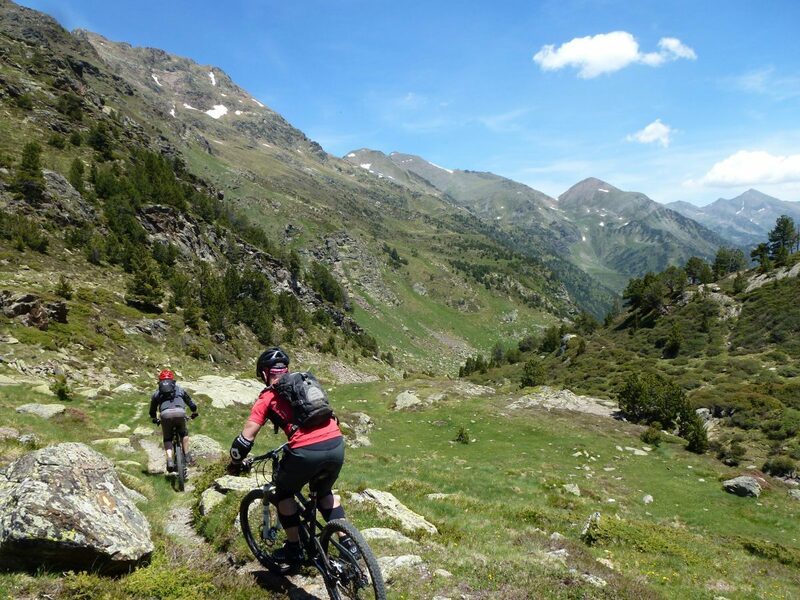 We are at very, very high altitude here, and the technicality of the singletrack reflects this too – but it gets less demanding as you come back towards the valley floor. The first section is steep and switchbacking on loose stony scree, dropping you to a beautiful mountain lake where we often have lunch and sometimes a swim! We continue downwards into a huge bowl, still above 2100m – this second section is studded with big, grippy, round rocks – it’s all about momentum maintenance if you want to clear it. It can be done! Don’t worry; from here it gets a lot easier – there’s a short push to get over the corner of the mountain, and then the second half of the descent begins. From here it is far less steep, and becomes more and more flowing the further you go. Entering the treeline the rocks give way to pine-needles and loam – and it is endless… it just goes on and on all the way to the valley floor! Every so often there’s a technical section to deal with, but the contrast to the earlier sections is amazing. 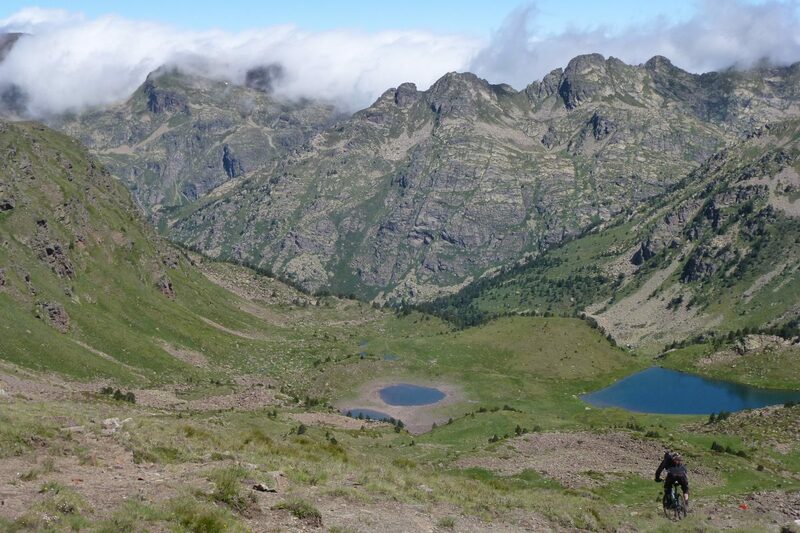 Once we reach Soldeu we hit a trail we mentioned earlier – “The Basement” – but from this point it is twice as long. This trail undulates its’ way down the valley for several kilometres, losing roughly another 400m along the way. There’s some large descents, some short ups and some crazy features: at one point you have to cross a wildly swinging suspension bridge over a river…and later you’ll find yourself clambering through a ravine holding onto guide chains! The final descent starts with a switchback that has only ever been ridden twice by guests before plunging back into Canillo for an end-of-ride “hops based recovery beverage” whilst we wait for the van to collect us! 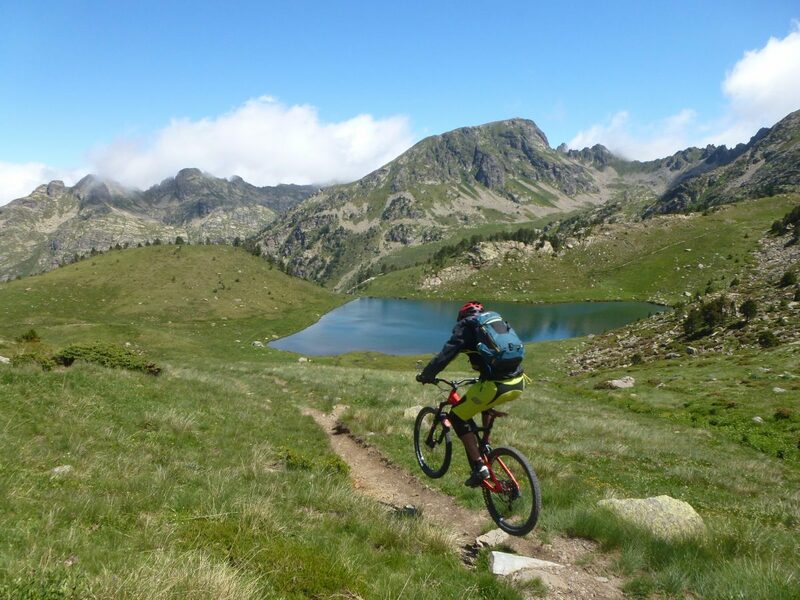 This giant uplift day explores hidden natural singletrack around the fringes of Vallnord, and completely eradicates climbing by using the gondola next to your hotel all day long! 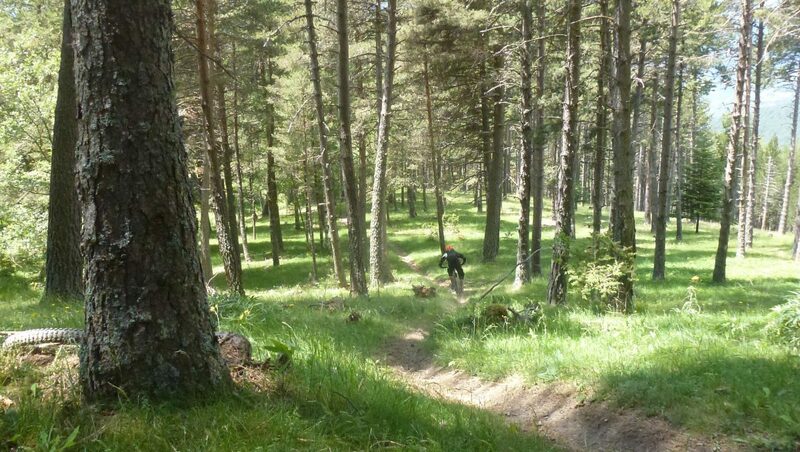 We will show you a great selection of hidden trails – we will start off with some less tricky trails, and later in the day we’ll take you onto some harder trails once you are warmed up! “Nu Skool”: there used to be a well loved trail in the bike park called “Old School”, but this was very sadly lost when the new Commencal track was built in 2015. However, as a response some of the locals got busy in the woods and have improved and modified a walking track which is similar, but on a different part of the mountain! 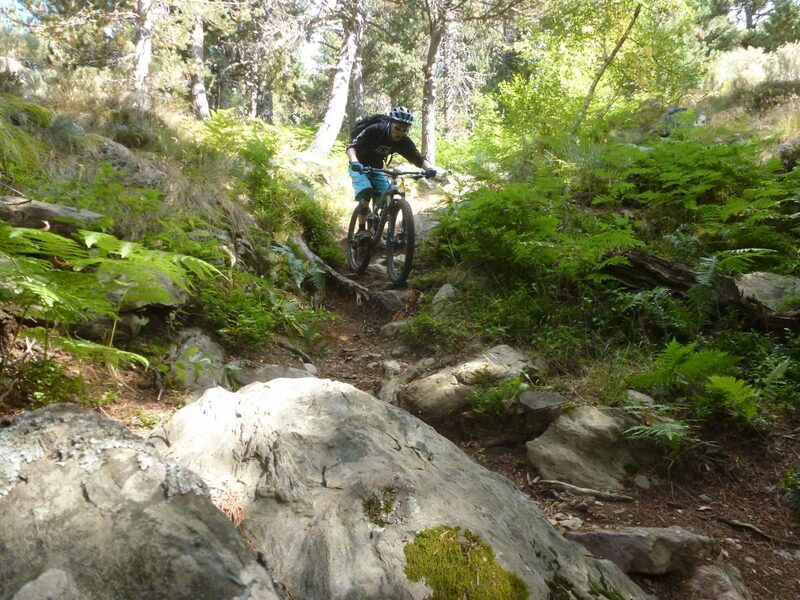 It is sometimes steep, but often more gentle and very flowing – it crosses bike park trails 3 times before spitting you out back in Massana. “Hidden Valley” uses the same upper section as Gulley Run, but about a third of the way down shoots off in another direction, unexpectedly bursting out of the dense trees into, well, a valley which is hidden! There’s some very tight switchbacks down here, and the views are fantastic. “FTC” will probably be final trail of the day; a trail of extremes: large chunks of it are flowing, non-technical and very easy. 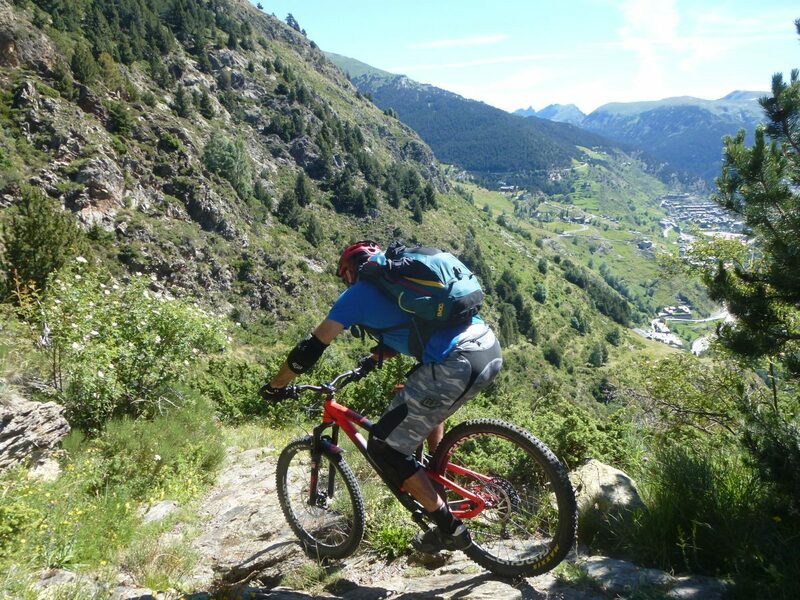 However, to access these sections you need to ride some of the toughest bits of singletrack we guide on in Andorra. It can be fantastically steep, sometimes on slickrock, and there are drop-offs, switchbacks and rock gardens. Why is it called FTC? Well, you will find yourself hanging off the back of the saddle; “Flossing The Crack” as our riding buddies used to call it back in the early 90’s! Our original hits now in one amazing compilation album! Locals Only is an all-time, nailed on classic – it has absolutely everything you could wish for. It’s a super-fast and flowing 10km descent on amazing singletrack down a wooded ridge, punctuated by little technical features: all very rideable, but somehow tricky looking! 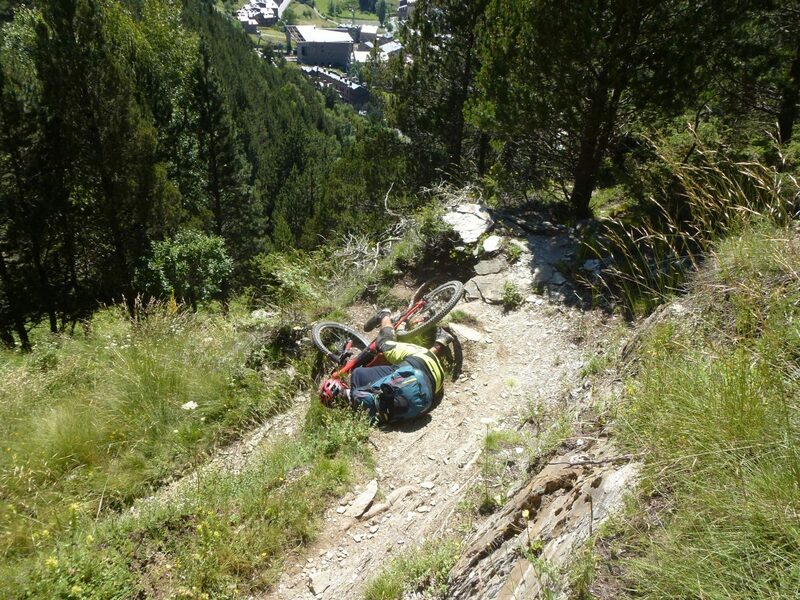 There’s lots of loamy flow, a gorge with natural jumps and a beautiful meadow section overlooking La Massana. It’s one of the best trails we have ever seen, anywhere – very fast and furious in places and we’d challenge anyone of any level to not absolutely love it! 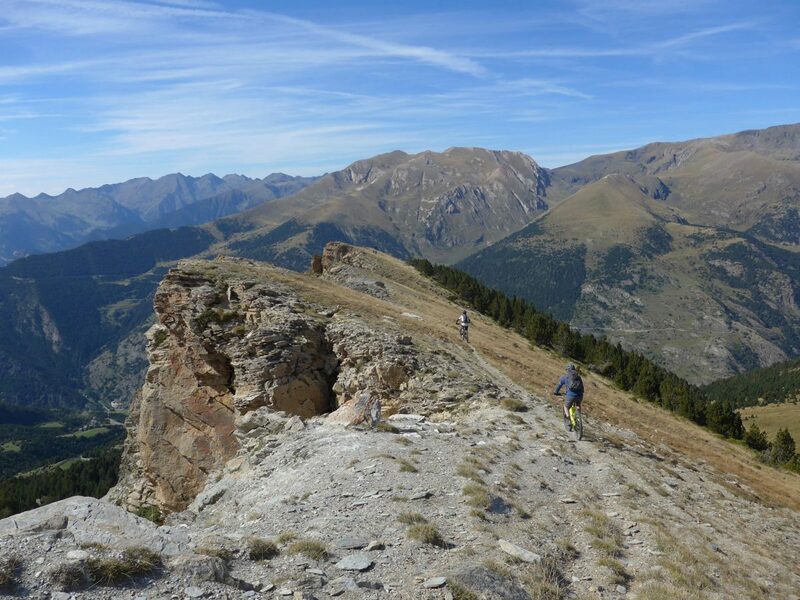 OCD (Off Col D’Ordino) plunges 600m down to Ordino: en route you’ll find one of the fastest bits of singletrack we ride anywhere, gnarly rock & root staircases, switchbacks and even a gulley of slickrock which winds its way through stream crossings and over wooden bridges. We call this section “Soggy Bottom” because almost every week someone misses a bridge and ends up sliding into the stream… There’s also the option to do a short-but-tough climb/push to “TechNeep”; a phenomenal descent that gives you another 400m of perfect flowing woodland singletrack with huge views, culminating in 15 fantastic switchbacks which bring us out handily close to a sunny village square full of bars! 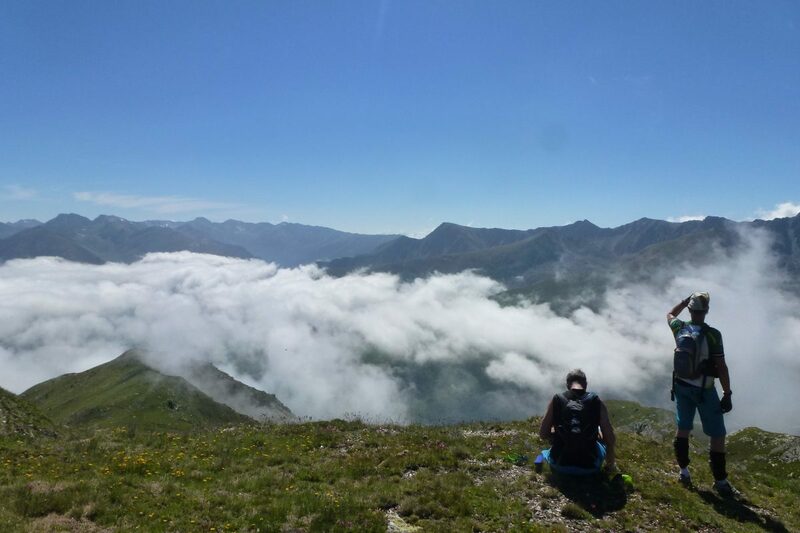 Finally we can even throw in the option of another trail, “Rochefort” (named by former French-born guide Keev; you can literally translate it as hardrock) which adds in a further 600 vertical metres of descending! 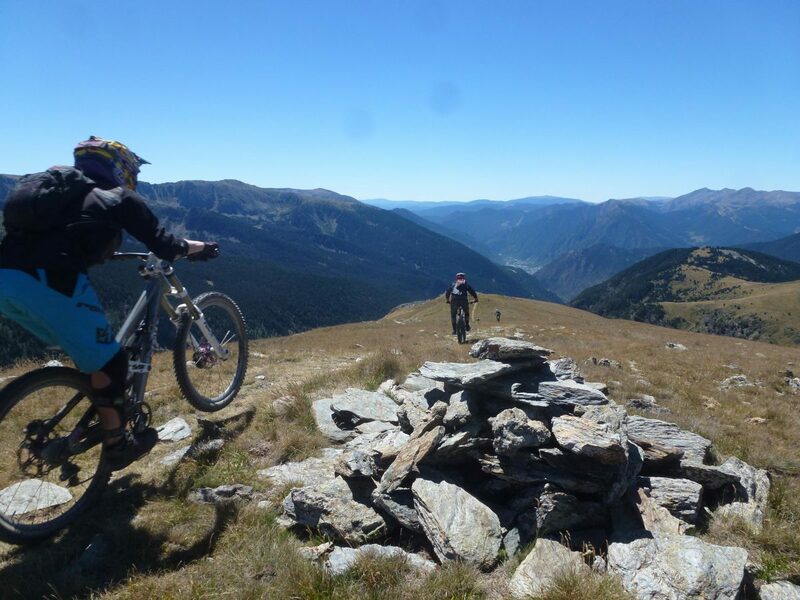 This one is intense; steep, highly technical and not for the faint hearted – you need very good skills to tackle this trail well – we have had very experienced riders tell us that it is the most challenging trail they have ever ridden. Unrelenting, unforgiving and unmissable if you want to be challenged! We normally choose a couple of these as a day out, or start early and run them all together as part of a huge uplift day (15E supplement) . In low season we can make a day’s riding out of any one of them if you fancy a gentle pedal up to look at the views. 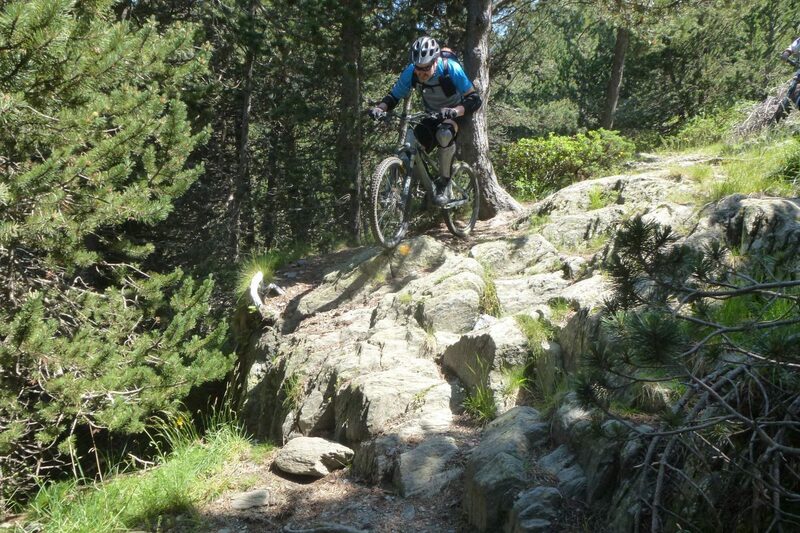 "5 stars - thoroughly recommend it to anybody who loves challenging natural technical single track "